We’ve already had a few hard frosts and freezes, lots of rain, a snow flurry, too, so the leaves are withering here in the Seacoast of New Hampshire. The wind has been howling and leaves that were the color of caramel and bright yellow just a few days ago are now all brown. They are being blown from trees in great clouds, twirling through the air and become snagged in shrubbery and across lawns. I don’t see many oak trees around the neighborhood but when I look out the window, it looks all oak on the lawn. We have a small-ish yard now so the leaf work is small-ish. I do feel bad for those who must remove truckloads of leaves from their property. This year, our association has decided to forego leaf blowing. That’s good and bad. The company hired to do the annual job comes with powerful blowers and blow away every last leaf along with an inch of the topsoil and mulch from the gardens. After witnessing this the first year I lived here, I’ve instructed them to skip my borders! Just the front lawn, please! As the second most forested state in the country, New Hampshire has a whole lot of leaves. Already we have great piles in our neighborhood with more to come. Piles of leaves left on lawns over the winter isn’t a good idea for grass. Some leaves are fine but the piles that I see from my window can create grass killing conditions. We’ll see what the association plans to do. It may be lawn mower mulching or it may be nothing, then tackle the problems it causes in the spring. My mother didn’t remove all leaves but had the niftiest leaf shredder for fall lawn cleanup. The tiny mulched leaves were then returned to the earth. I wish I had one for excess leaves on the back lawn but I don’t. I rake them from the lawn. But I leave all that fills my borders unless I see signs of leaf disease. Where I have mulch is where the leaves remain… under shrubs and around perennials. Leaves serve as an insulator and return organic nutrients to the soil. Maybe our gardens don’t look as pristine and clean as neatly blown borders but our leaves also provide a valuable habitat for insect species. There are butterfly caterpillars and eggs in there, and queen bumblebees, spiders, beetles and more. In late spring, I remove some leaves after the bumblebees are active but sometimes I mulch right over the leaves. It’s a very good thing! With our late March snowstorms, the lone Bradford pear tree in the neighborhood could no longer bear the snow weight and lost 90% of its limbs. The tree was removed and thank goodness! If Michael Dirr, professor of horticulture at the University of Georgia and my go-to expert on woody plants, says the tree is a ‘scourge,’ then it is. Once the darling of the nursery industry in the 1950’s, we now know what a mistake it is to plant a Callery pear. The trees are probably a true harbinger of spring with their very early beautiful, white blossoms (that come with a stench!). The Callery pear was brought from China and found to be fast growing, disease resistant, adaptable to numerous climates, soil types, sun or shade and pollution. As the Bradford tree grew in popularity, nurseries began developing several cultivars, Chanticleer pear, Aristocrat pear, Cleveland Select pear…. as the Bradford was soon to be found to have major flaws in the branches that grew at weak V-shaped angles from the tree. Trees began to split or lose branches. New cultivars somewhat improved the problem but the Bradford continued to reign in landscapes and as a urban street tree. In many areas of the country today, the tree has spread into wild areas choking out natives. Cultivars themselves aren’t invasive but the combination of different cultivars hybridize and produce fertile fruit. Several states have listed the tree as invasive and in many areas, it is forbidden to plant one. I poked around online but didn’t see any information about the tree being invasive in New Hampshire. Virginia, my home state, is one area that lists the tree as an invasive plant…. and I just returned from a whirlwind trip to Ohio and Kentucky where landscapes and woodland edges were white from pear tree blooms. It’s listed as invasive in Ohio. Beautiful to behold but who knows what the impact of escaped trees is to our ecosystem. A little past bloom peak, I photographed this pear tree lined avenue in Louisville KY as we drove by last week. I wouldn’t park my car beneath those branches! Our first glance out of the morning window during this last snowstorm gave us a Dr. Zhivago-like feeling. A foot of heavy, wet, thick snow covered our world. Trees and shrubs bent against the ground, trees down, limbs everywhere…. and no internet. It was a rude awakening on how much we depend on the internet. I’m not a TV watcher but mistergardener missed his morning news and sports updates. If you can’t use your smartphone at all, can’t venture out on bad roads, can’t communicate with folks, the day seems much longer. How amazing it is to remember that not that many years ago, no one had internet and smart phones. So how did we spend our day? I took some snow photos, I caught up on reading my book club book, I worked on needlepoint, and I knitted hats for charity…. I don’t think I mentioned that the storm interrupted the paint and repair job we were in the middle of. Yes, all floors and furniture were covered with tarps, tables were piled high with books, wall hangings, and everything else from shelves, while the entire downstairs was being painted, wallpaper removed, and ice damage finally repaired. Finding a place to sit was a challenge. Exeter has been upgraded from last summer’s Extreme Drought to a Severe Drought. And thanks to winter rain and snow, the Exeter River is flowing at near normal levels. It is a beautiful sight and still draws folks to marvel at the free flowing river after the removal of the dam. Temperatures are beginning to rise and we hope it’s a slow warming trend. Exeter now needs the ground to thaw enough to absorb some of the snow melt as it takes longer for groundwater levels to recover. Water restrictions are still in place and residents are urged to monitor their water use. 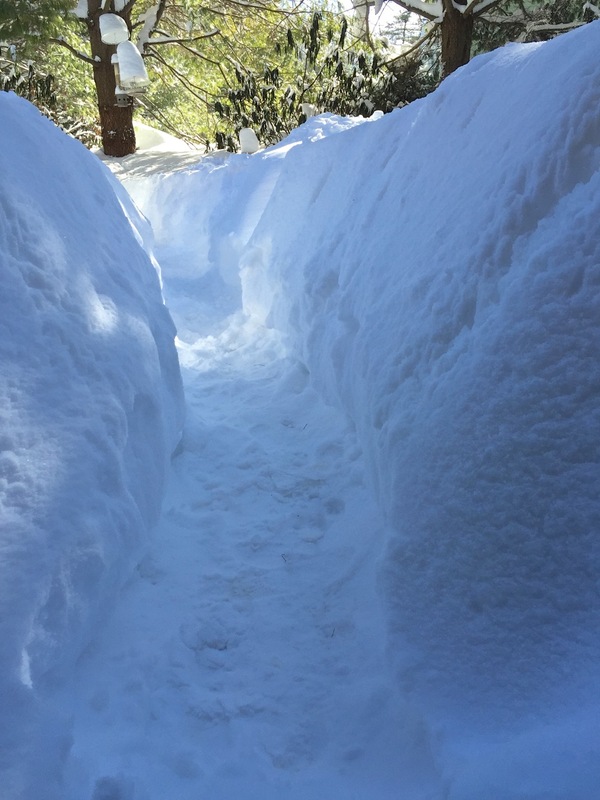 It has been an extreme few weeks in New England that has brought us over 40″ of snow in our area of New Hampshire. Today the snow is coming down steady again… enough that the snowplows have cleared our drive 4 times! We always feed the birds but during severe weather we step up our support as natural food supplies are difficult to find. We have trenches and we shovel out to refill feeders twice a day. The snow is as light as ivory flakes so the shoveling isn’t strenuous. And, amazingly, it’s full of tunnels where the squirrels are searching for wayward birdseed. They pop up here and there like Whac-A-Mole game. 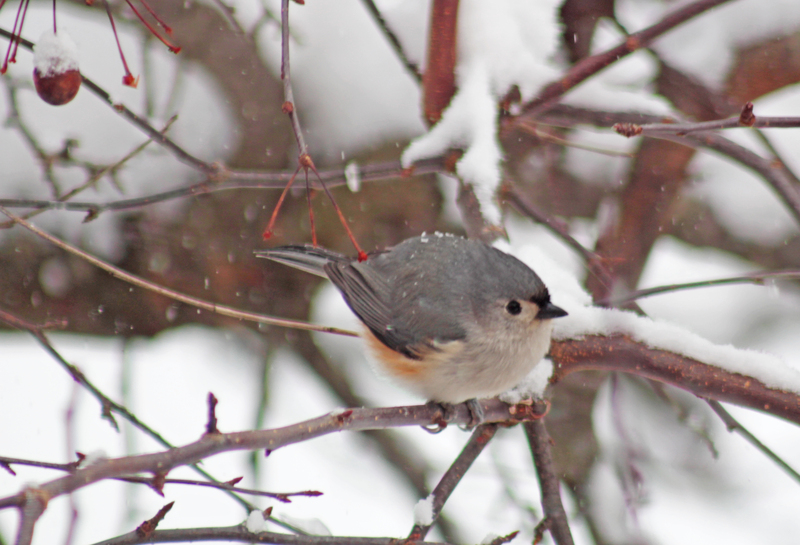 The familiar backyard avian crew frequents our feeders… just in greater numbers in this weather. 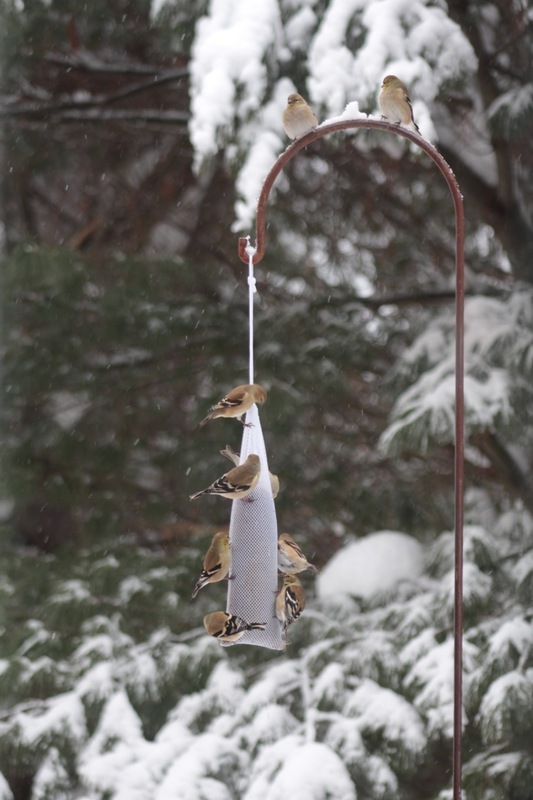 The black-capped chickadees, the white-breasted nuthatches, tufted titmice, and tons of American goldfinch, pine siskins, and purple finches dine on the tube feeder and the covered bluebird feeder. 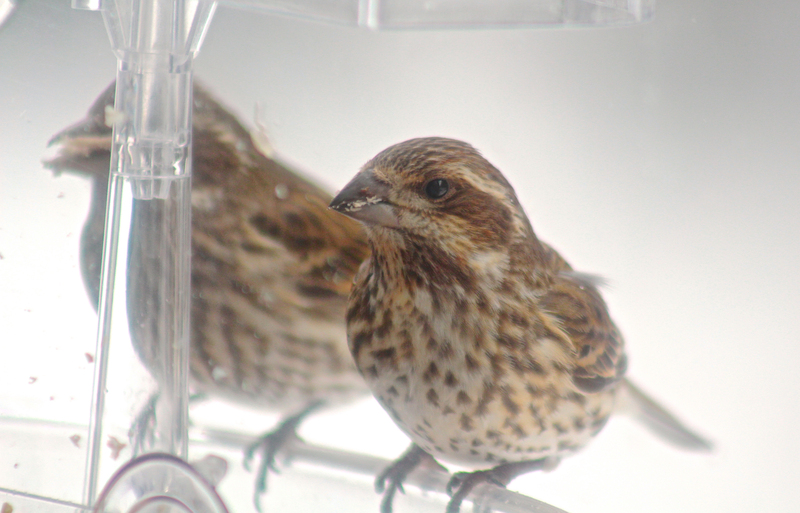 The noisy finches that number in the twenties also monopolize the nyjer seed feeder. 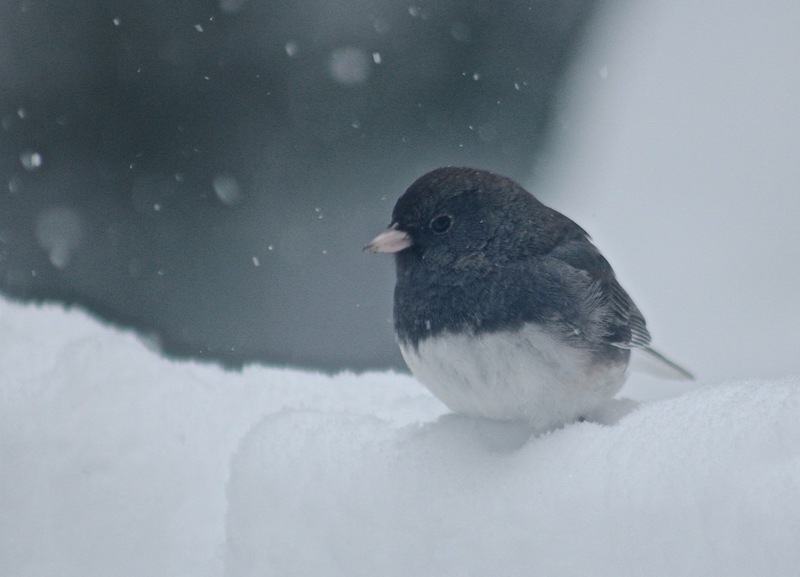 Northern cardinals, mourning doves, a handful of blue jays, white-throated sparrows and a few other sparrows, a large number of dark-eyed juncos, a common redpoll or two, American finches and pine siskins hop around atop the snow for the seeds we scatter. 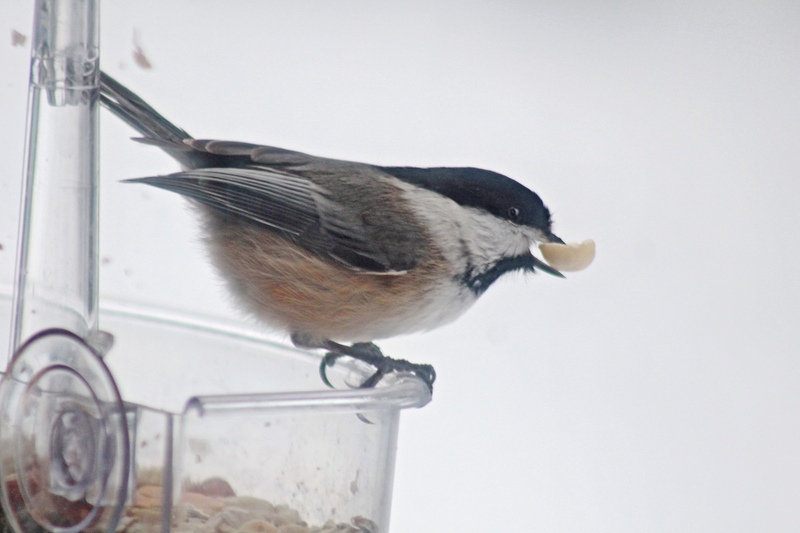 Red-bellied woodpeckers, Hairy and Downy woodpeckers, white-breasted nuthatches, the chickadees and titmice go through the suet in no time. The avian activity provides a lot of excitement and entertainment at our house. 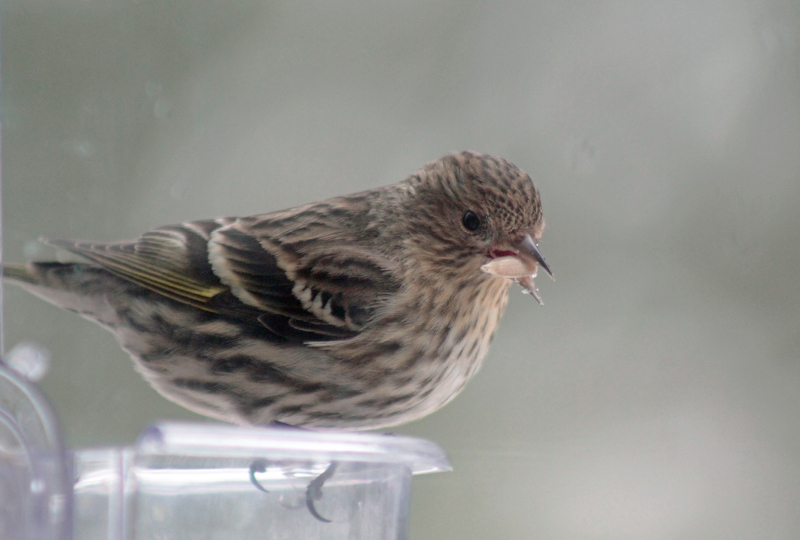 Breakfast, lunch, and dinnertime at our table are hives of activity at the window feeder. We enjoy watching the shy, the gregarious, the bullies, the bold, the eat-and-run birds, the noisy, and the birds that like to watch us watching them. 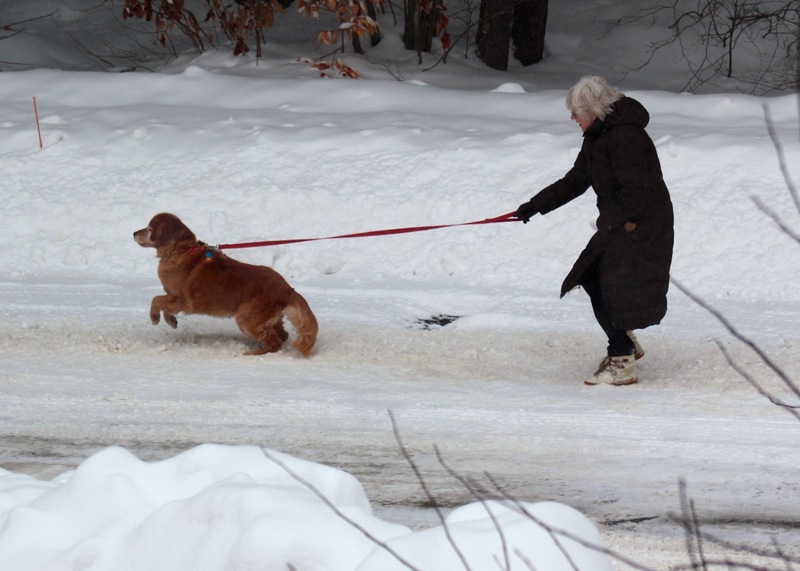 At least it’s a leisurely hobby that you can enjoy from the comfort and warmth of your home… unlike some of our neighbors who must wait for the snowplow to clear enough snow so their animal friends can have a little recreation. Brrrr…. Happy Day to you, Earth! There will be the annual party for you today on the National Mall where citizens will rally for your protection to the music of numerous bands and the words of many speakers. And worldwide, over a billion people will bond with voices and commitments on this 2012 Earth Day and call upon everyone to do their part for a sustainable future. 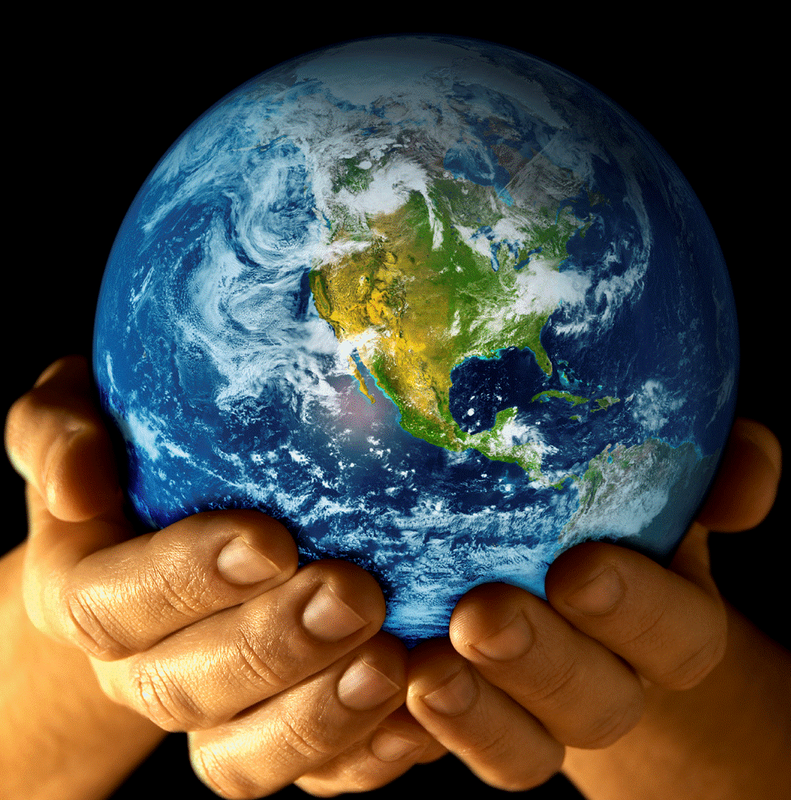 In this household as in many others, we celebrate Earth Day daily but it is important to come together once a year to recognize your gifts to all who depend on you for life. 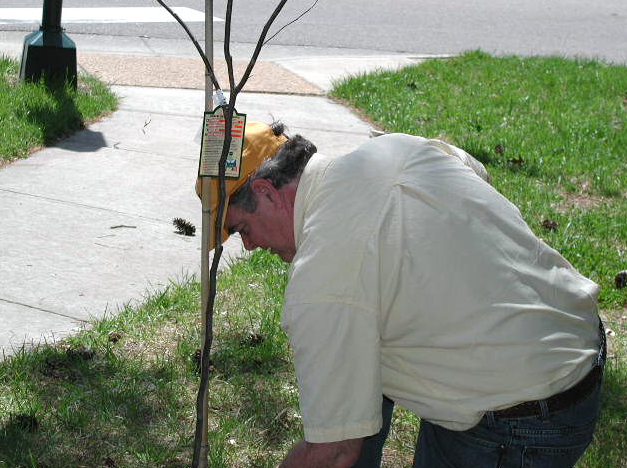 In a small way, I’ve celebrated this time of year by giving and planting trees to schools, clubs or communities, first for Arbor Day, then after 1970, for Earth Day. 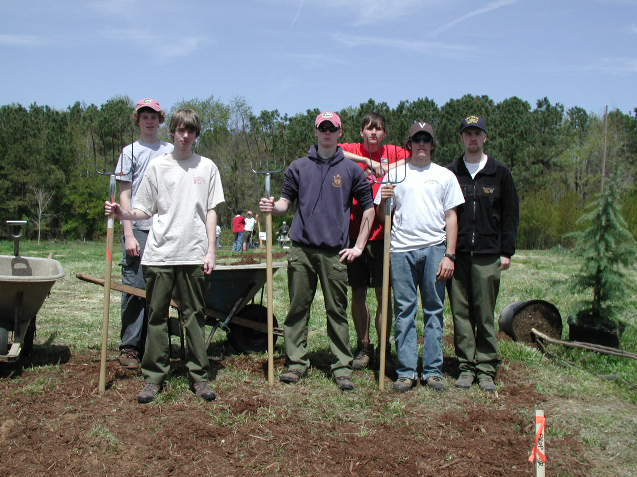 In 2004, those trees were gifted to mark another occasion… Andy’s Earth Day in Williamsburg, Virginia. 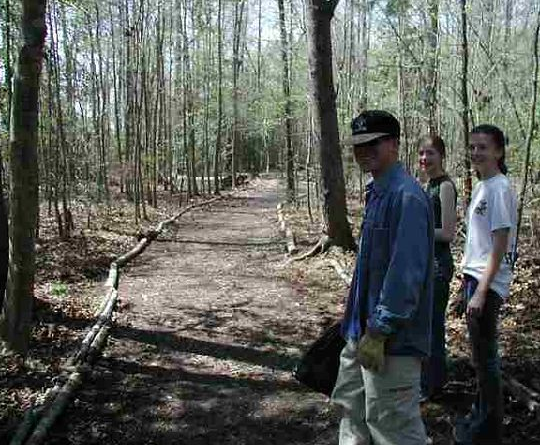 On Greensprings Trail in 2004, over 100 friends and family members gathered that year to recognize and honor the life of my nephew, an Eagle Scout, Colonial Williamsburg Fife and Drum Corps graduate and Biology major at Christopher Newport University, who tragically lost his life in a canoe accident the previous year. We gathered to clean the trails, rake, pick up debris, and plant native trees and flowers on the trail where Andrew helped make the signage and gave nature tours to youngsters, for he loved nothing better than to pass on knowledge, the appreciation of nature and environmental awareness. At the end of the day, family and a few friends migrated to Geddy Park in Williamsburg, the site of Andrew’s Eagle Scout project, to clean and plant in that park setting. Since that time, the annual Andy’s Earth Day has continued. A spur trail from the Greensprings Trail now spills into a clearing near Jamestown Settlement onto an archaeological site of the historic Church on the Main, a site excavated by Andrew’s father, archaeologist Alain Outlaw. 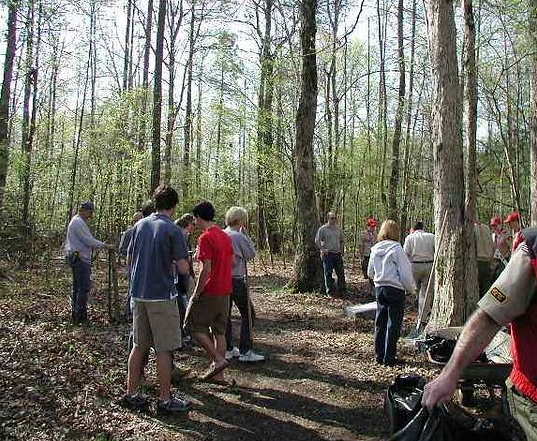 The site, protected by Williamsburg Land Conservancy, is where the annual Andy’s Earth Day takes place. 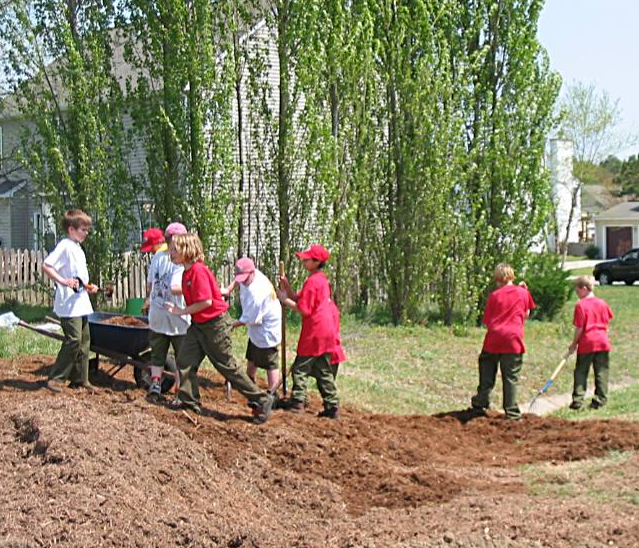 Boy Scout Troop 103 spends the weekend cleaning and maintaining, adding paths, planting trees, and earning merit badges…. rain or shine! There is no better way to build a deeper awareness and convert ideas into habits than starting with the young. I’m in New England now but I still feel the energy from Andrew and Andy’s Earth Day as I kneel to plant new life in these New Hampshire gardens. Let’s hope the many who stand together today can channel that energy into action, perhaps joining with a Billion Acts of Green… or in a more personal way… today and the other 364 days of the year. At first they looked insignificant and harmless but these plants were really the devil in disguise. Like those really bad reptilian creatures with sharp teeth and claws who rampaged a town in the 1984 horror movie, Gremlins, I am currently under attack by a weed…. a devil weed, a dangerous villain, a Gremlin. It’s Garlic Mustard (Alliaria petiolata), a biennial plant in the Mustard family. Native to Europe, it is thought to have been brought to America in the 1860s as a culinary herb and indeed, it is edible. The small rosettes of leaves appeared among my roses and lavender several years ago. I pulled up tons without recognizing the weed until successive years when the plant had matured into tall shoots, competing with the lavender, then moving on to other borders . Each year, I weed and weed and I think I’ve gotten it under control but when I turn my back, it multiplies as fast as those little Gremlins that terrorized an entire community. It is a destructive invasive plant that is controlled best by hand-pulling before the plant goes to seed. Each mature plant can produce over a thousand seeds and once it produces seeds, it can become so prolific that it is difficult to eradicate. 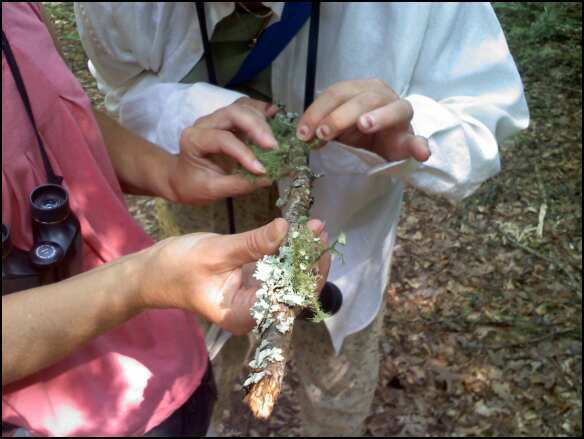 When it’s introduced into a new environment, it can aggressively spread into woodlands where it out-competes native plants and flowers that insects depend upon for life. The West Virginia White Butterfly (Pieris virginiensis) and the Mustard White Butterfly (Pieris oleracea) that lay eggs on Toothwort plants are choosing to lay eggs on Garlic Mustard which has proved toxic to both the eggs and larvae. The plant also produces toxins that suppress the mycorrhizal fungi that plants require for growth. The plant has no natural enemies. For very heavy infestations where risks to desirable plants is at a minimum, applications of systemic herbicide glyphosate can be effective. Since the seeds remain viable for five years in the soil, diligent monitoring is important. After weeding, do not compost this weed as the plant can germinate in the compost bed. PS: I uploaded the wrong photo. I moved and now I live in New Hampshire. Wikipedia supplied the photo of Garlic Mustard for this post. In 2007, the Lipton Tea company announced its pledge to harvest tea leaves using only sustainable farming methods. The company joined forces with Rainforest Alliance, an organization dedicated to biodiversity, protecting wildlife habitats, conservation of water and soil, and the well-being of workers. 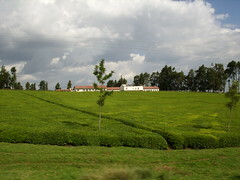 The Lipton Tea estate in Kericho, Kenya, was the first estate to be certified by the Rainforest Alliance in 2007 as a model of sustainability. 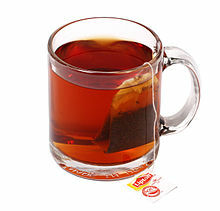 By 2015, Lipton pledges that all of its tea leaves around the world will come from sustainable farming and ethical systems. For the past 55 years, Lipton’s largest teabag production facility in the U.S. has been located in Suffolk VA. The company imports tea from 25 countries and makes 6-billion tea bags a year. In 2008, the company began an environmental campaign of their own. Plant manager Ted Narozny revealed that this was an employee driven quest for local company sustainability. Over 70 ideas poured forth leading to a gold medal award in 2009 from the governor of Virginia in cooperation with Virginia Department of Environmental Quality, Virginia Department of Conservation and Recreation, DuPont Corporation and Dominion Virginia. Suffolk’s Lipton plant has been declared a Zero Landfill facility, no easy feat in this day and age. 70% of the company’s waste products is recycled or reused, 22% is composted and the final eight percent is reused. A bonus for the company’s efforts, they estimate their achievements have saved the facility a whopping $100,000 a year… which they reinvested in more energy savings in the building. At the Garden Club of Virginia’s 52nd Annual Conservation Forum this month, Ted Narozny accepted for the Lipton facility, the club’s Elizabeth Cabell Dugdale Award for Meritorious Achievement in Conservation. A conservation award first presented by club in 1974, it is presented to an organization, industry or an individual who is not a GCV member for outstanding work in conservation. As I listened to Mr. Narozny praise the employees of his company for their commitment to reducing the facility’s environmental impact, I was inspired by the resourcefulness and the might that individuals who join forces can generate. They’ve led Suffolk’s facility to produce the greenest tea of all. Wild and wonderful could describe both the Dragon Run and the enthusiastic woman who led several folks on a Saturday morning outing through trails owned by the Friends of Dragon Run, the non-profit group that supports the woodlands, swamp and stream. Vivacious and enthusiastic, Teta Kain is energized by the pristine watershed that feeds the 40 miles of the Dragon Run stream, emptying into the Piankatank River and eventually the Chesapeake Bay. She’s a naturalist, a wildlife photographer, a bird enthusiast, a butterfly expert, a writer, and a self-professed lover of ‘critters’ that inhabit our world. I have been fortunate enough to hear several of her talks, kayak the Dragon with her and now I have experienced the passion she has for the flora along the trails in this unspoiled wilderness, a rare ecosystem that the Smithsonian Institution ranked second in ecological significance in a study of 232 significant areas of 12,600 square miles of the Chesapeake Bay region. 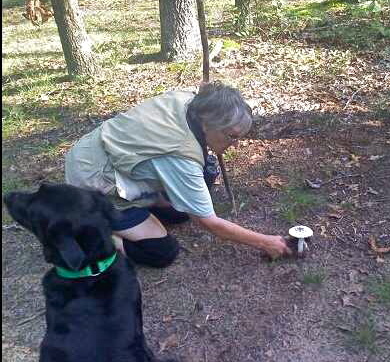 Teta with her friend, Kohl, show us how to ID a mushroom using a mirror. The Nature Conservancy, the Virginia Department of Forestry, and Friends of Dragon Run have partnered to protect the watershed but the Friends of Dragon Run provides the only access to the area for kayaking and hiking. 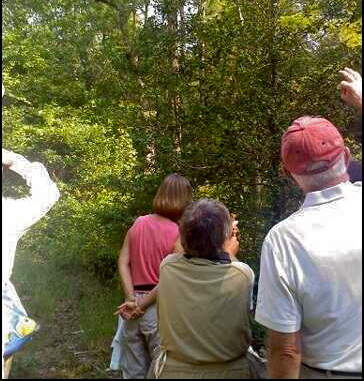 It also provides guided tours on both to view and study the flora and fauna. Although there are posts along the trails that identify American hornbeam, mockernut hickory, bald cypress, devils walkingstick, possumhaw, fetterbush, partridgeberry, spotted wintergreen, and flowers with names like Elephant’s foot, we would not have learned all we did without Teta who would easily drop to the ground with a mirror to teach us to identify mushrooms by reflecting the differences in the gills to us, who pointed out the small differences in species of ferns, who could identify spiders and butterflies, fungus and Lycopodiums and even our feathered friends that inhabit the wilderness. It is refreshing to know such a dedicated volunteer like Teta who is committed to teaching and protecting the unique ecosystem of Dragon Run, hoping to light a fire under others. The future of the Dragon as a wild and wonderful watershed is not guaranteed. Development always threatens. Let’s hope the Dragon can remain pristine and vital. Pssst…. You could help! The Friends of Dragon Run does accept tax deductible donations to further conservation, education and protection of the watershed. Want to know more? Check it out: www.dragonrun.org.